A mix of sunflower seeds, almonds, cashews, pumpkin seeds, hazelnuts, coconut chips, linseed and sesame, finished offwith apple cubes, figs and red currants. 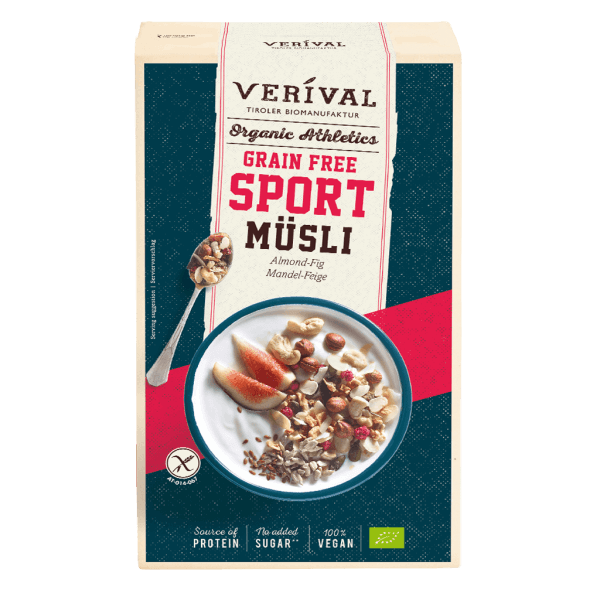 A vegan source of protein for an active start to the day – without any grains. No added sugar & purely organic. Good morning! Sunflower seeds*, sliced almonds* 15%, pumpkin seeds*, chopped figs* 10% (figs* 97%, rice flour*), cashew chunks* 9%, apple cubes*, toasted coconut chips*, brown linseed*, hazelnuts* 4%, sesame seeds*, roasted and chopped almonds* 3%, red currants* 3%. > May contain traces of soybeans and other nuts. Best enjoyed with fresh fruits, milk, natural yoghurt or plant-based alternatives.